PINELLAS COUNTY, Fla. — A brand new non-profit in Pinellas County is getting attention from all over the country. Beds for all Paws started in January and in just three months have made nearly 1,000 beds for shelter animals. Cindi Hughes found a need after visiting a local shelter and noticing that none of the dogs had beds. Many shelters don't allow beds because of the stuffing. 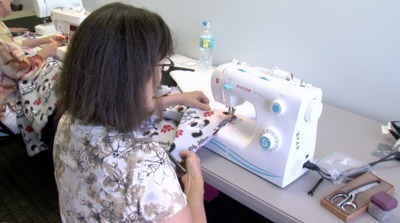 Cindi started an initiative to sew towels or blankets together to create a bed. Shelters could wash the items and stuffing wouldn't be an issue. She recruited some volunteers and her idea became a reality. "We can take a comforter, stitch it into six or eight beds and they can use them over and over again and wash them over and over," says Hughes. Now, the group hopes that they can create 20,000 beds this year. "What we've discovered is more than just making beds for dogs, although that's our main goal, this group means a lot to a lot of people," says Hughes. In order to create 20,000 beds they need volunteers and old towels and blankets to make that happen. Beds for All Paws has events on May 2 at the Hamburger Mary's in Clearwater and another on June 3 at the Clearwater Threshers game. You can find more information at www.bedsforallpaws.com .